JONES BEACH, LI (CelebrityAccess MediaWire) — The theater at Jones Beach was evacutated on Saturday, during concert by R.E.M., Modest Mouse and The National after the building was struck by lightning. According to Newsday, the strike came at approximately, 8:35 PM during Modest Mouse's set, causing sparks to fly from the building and causing minor injuries to one patron. 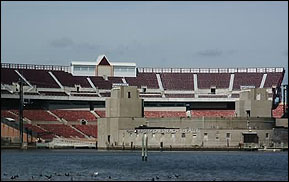 A spokesman for the parks agency told Newsday that during the evacuation, concertgoers were told to seek out safe places such as enclosed parts of the structure or their vehicles. The show must go on however and after the all-clear was given, the concert resumed with R.E.M. taking the stage just after 10:00pm.